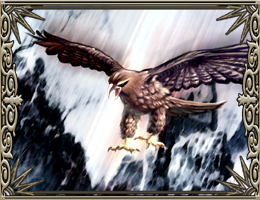 These fierce flying falcons are the favorite pets of the roving barbarians in the north. In combat, they swoop down from the sky and surprise their targets. Their hooked beaks and strong talons can deliver severe damage. Upkeep Cost 8.00 Gold 0.01 M.P. This page was last edited on 20 October 2010, at 05:14.